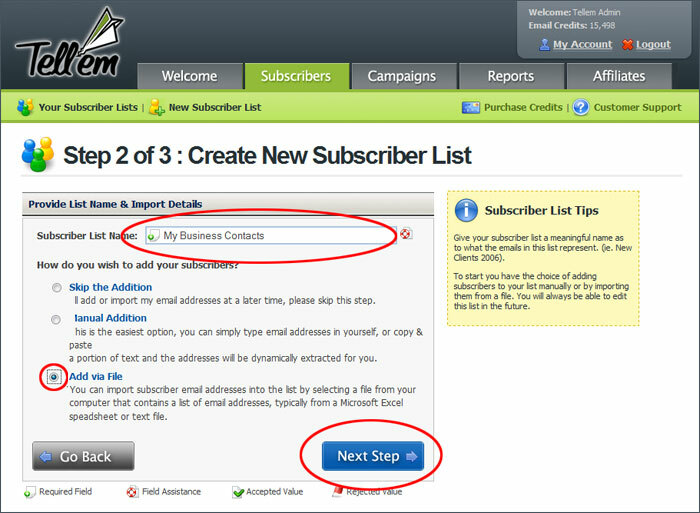 To add subscribers via file to a new subscriber list follow these steps. 1. Click the Subscribers tab. 2. 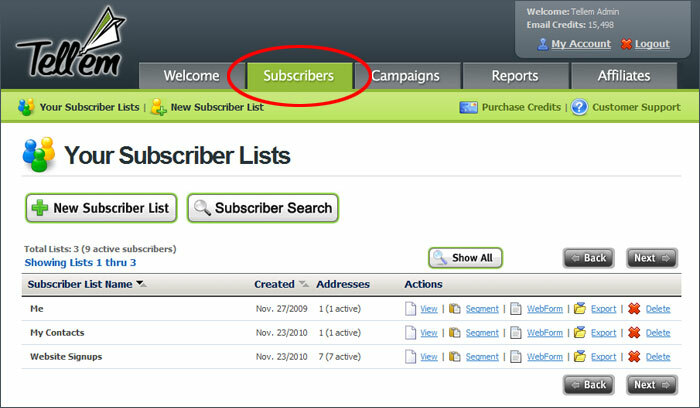 Click the New Subscriber List button. 3. Name your subscriber list (eg. My Business Contacts). 4. Confirm that your list follows spam compliancy laws by checking the boxes for My subscriber list is 100% permission based and I did not purchase this list from any source whatsoever. 5. Click the Add via File button and then click the Next Step button. 7. If your list has Name headings on the top row click the Do not import first row of column header names from my file. 8. Click the Next Step button. In this example we have selected not to use the the column headers. If you are unsure what each column contains it can be useful to include the headers as this will help you to map the fields properly. The system won't include the headers as a record as the required email address field will not be formatted correctly (Email Address is not a valid actual address). 9. The next screen will show you the first record to be imported and what those fields contain. Select from the Drop down box where each field should be mapped to. If a field does not have a destination select the Maps to Nothing and the system will not include that field in the import. Note: In the example below The website address field has been mapped to nothing and will not be included in the import. 10. 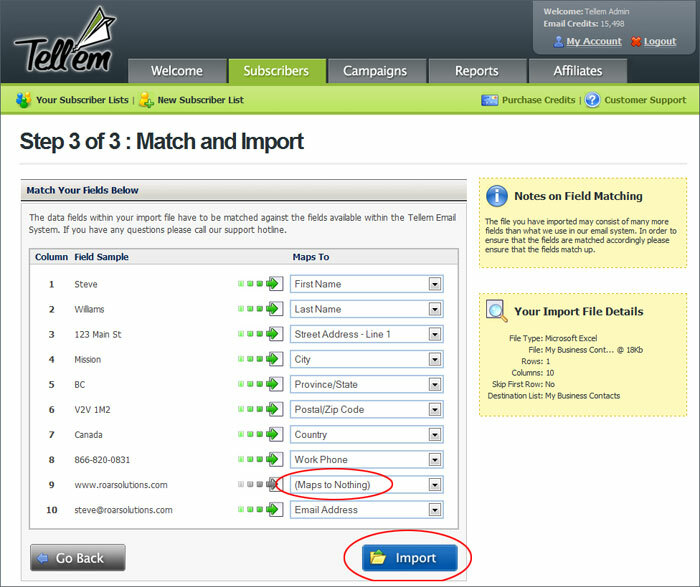 Once all the fields have been mapped click the Import button. 11. The next screen will show you whether the import was a success or not and if it was successful it will show how many addresses were imported. 12. After verifying that the correct number of addresses has been imported (duplicates will be removed automatically) click the Finish button to complete the upload of your subscriber list. You must map at least one field to the Email Address field. If a contact does not have an email address, it will not be included in the import. It is worthwhile to spend some time with your list in its original format (eg. excel spreadsheet) to ensure the fields are complete, correct and contain all the data you want to include with your subscriber list. 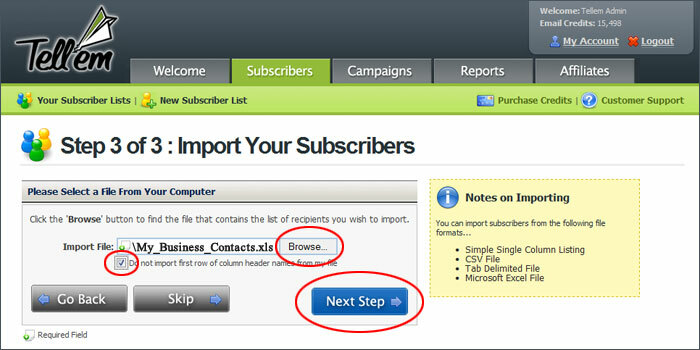 It is easier and takes less time to remove extra columns and data that will not be used before you begin the import. If you are using a personalization code like [FIRST_NAME] in your campaigns, but you do not have all of your contact's first names in your subscriber list, it can be usefull to enter a default name like "Friend" or "Colleague". This system allows you to personalize your campaigns and pull in information like First Name, eg. Your campaign code looks like this " Dear [FIRST_NAME]," if the first name field is blank for a subscriber, it will display "Dear," but if you have included a default First Name like Friend then it will display like this "Dear Friend," and if the subscriber's first name was Steve it will display "Dear Steve,"
You can view the Import Details of your list on the right side in the yellow box. Although a subscriber can be in multiple lists if you are sending a campaign to multiple lists that may have duplicate addresses, the system will remove the duplicates and only send once to each recipient.